Ford is celebrating the 100th anniversary of the moving assembly line by announcing plans to boost global production by 33 percent to 8 million vehicles annually by the year 2017. The current pace, which is around 6 million vehicles a year, would be increased by requiring each Ford assembly plant to produce a minimum of four models. The moving assembly line came into life on October 7, 1913, when Ford broke the assembly process down into 84 unique steps by having small groups of laborers work on specific aspects of a vehicle as a rope pulled the vehicle chassis down the assembly line. This process cut down the time required to build a Model T down from 12 hours to about an hour and a half. 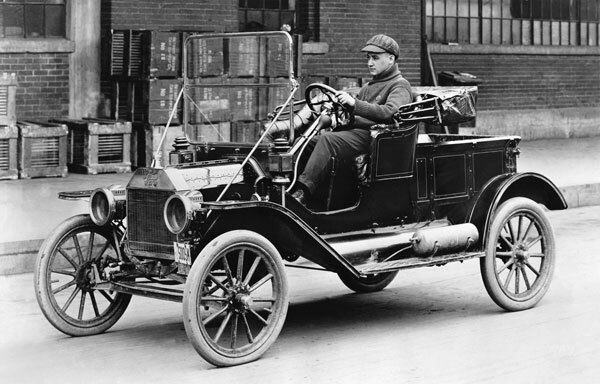 This process sparked a surge in production that helped make the Model T a 15-million seller by 1927. It also helped lead to the famous $5 a day wage increase in 1914, a move that helped create and strengthen America’s middle class. In order to hit the established goal of 8 million vehicles produced annually by 2017, Ford will need to operate 90 percent of its assembly plants with three crews; currently, 65 percent of all Ford assembly plants run three crews. According to USA Today, Ford also intends to introduce up to 114 new or improved models over the course of the coming five years.